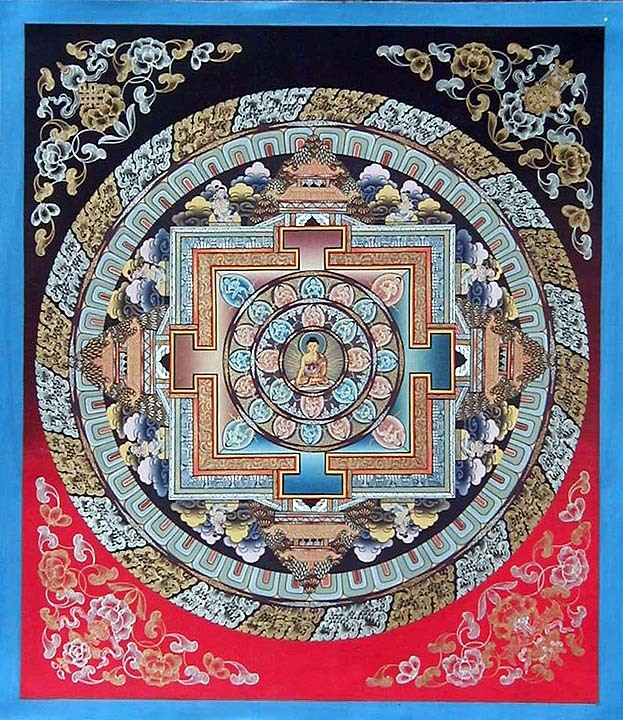 Kalachakra, also known as the 'Wheel of Time', is the most complex of all the supreme yoga tantria deities. He has four faces, twenty-four arms, and two legs. He wears a tiger skin around his waist, gold ornaments, vajra earrings, bracelets, belt and necklace. 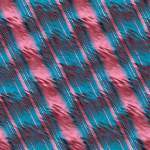 His torso and central face are dark blue or black, his right face is red and his two left faces are white and yellow. His right leg is red and his left is white. He tramples the Hindu gods Ananga and Rudra and their respective consorts. 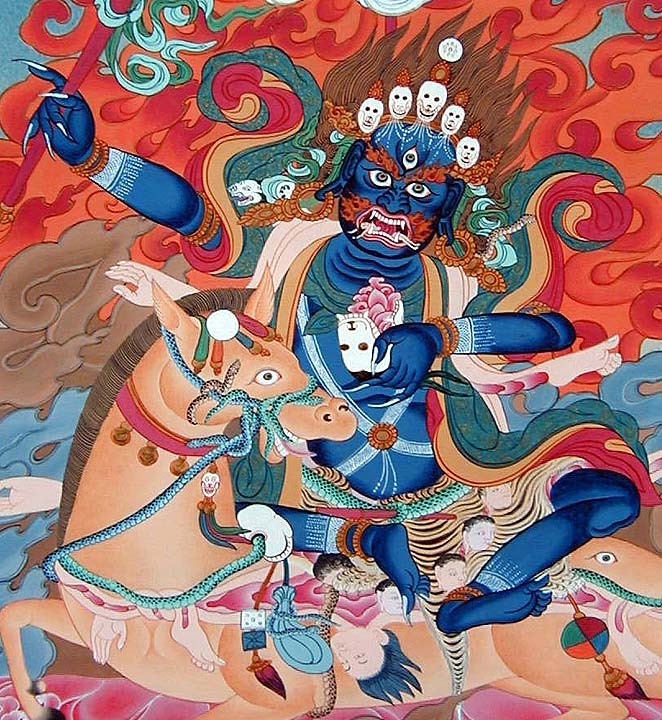 Kalachakra's eight lower arms are dark blue or black, the eight middle arms are red, and the eight upper arms are white. 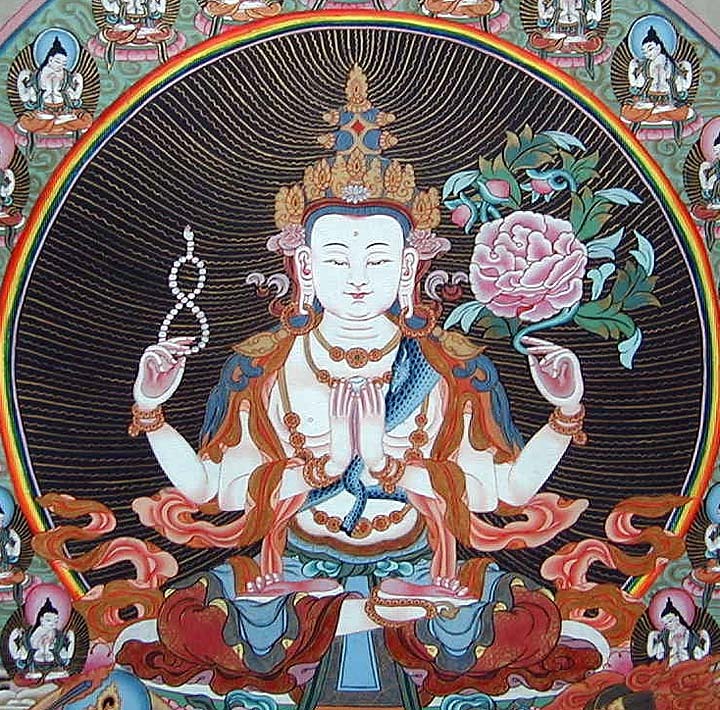 Each hand holds a symbolic tantric implement. He embraces his consort Vishvamati with his two principal arms, whose hands hold a vajra and bell. She is gold in color with four faces, eight arms, and two legs. 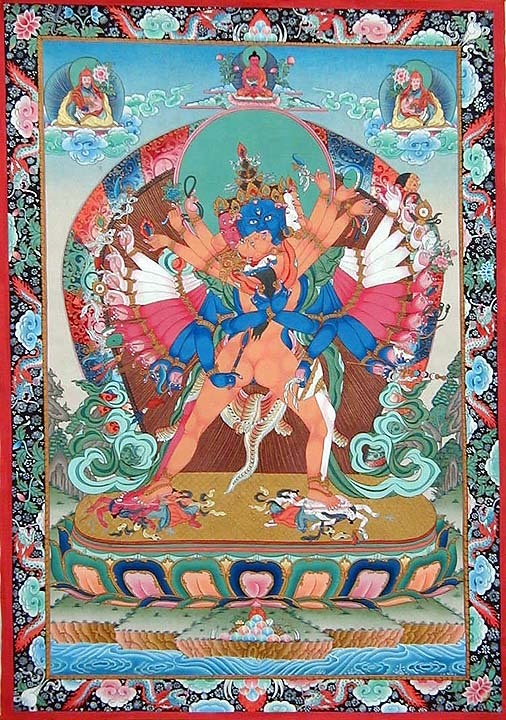 The Glorious Goddess, is one of the most important protectors of the Geluk order and the guardian of Lhasa. 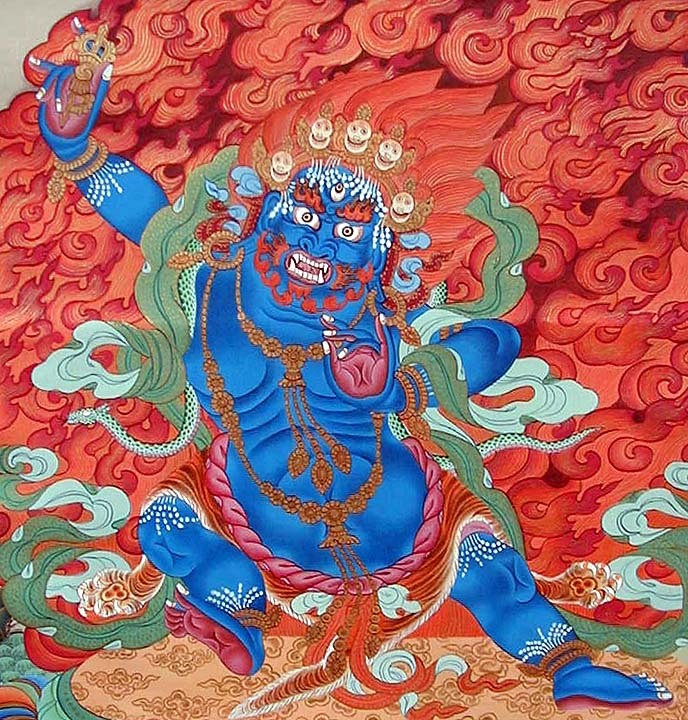 Mahakala is one of the Eight Terrible Deities of the Buddhist pantheon. 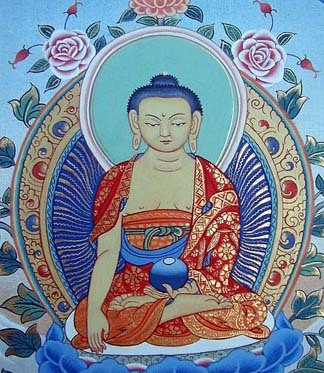 He is shown white, with ornaments of a Dharmapala. He has a third eye, his eye brows and hair are flames and he wears a crown with five skulls for jewels. 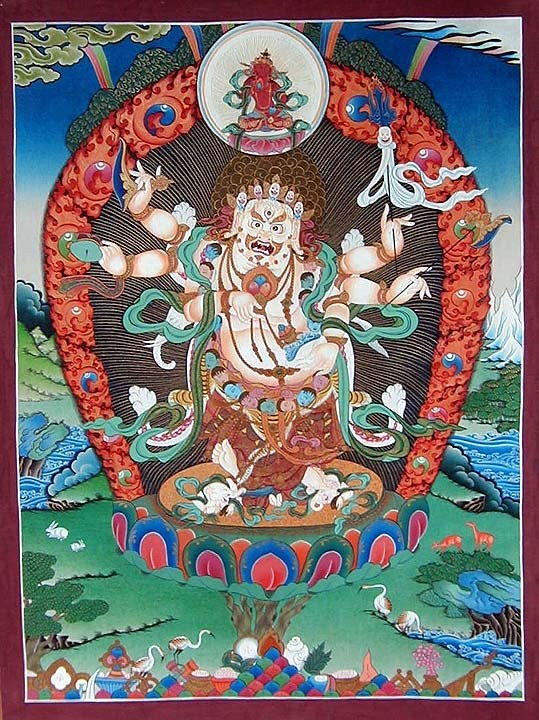 He has six arms and each hand holds a Tantric implement. 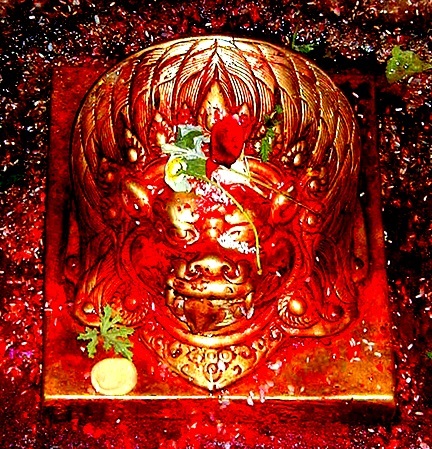 He is shown trampling the Hindu god Ganesh. As a Defender of the Faith he is often placed near the door at a Buddhist Shrine. Hevajra belongs to the supreme yoga tantra and is practiced by the Sakya Order. 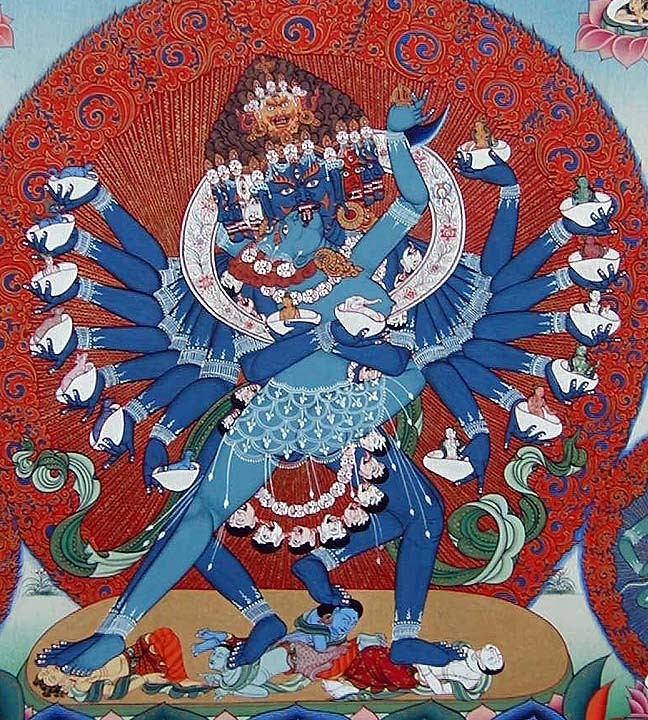 He is shown as dark blue, with sixteen arms, and eight faces, and four legs. He wears bone ornaments, a crown of skulls, and a garland of 51 freshly severed heads. He is trampling lesser gods. In each of the sixteen hands holds a skullcap. The skullcaps on the right each hold animals, the ones on the left hold Hindu gods. He is shown in sacti with his consort.